GoodSync will automatically backup and synchronize all your important files so you never need to worry about losing your emails, precious family photos, contacts, MP3s, and financial documents. GoodSync works locally - between desktops, laptops, servers, and external drives, but it is also capable of backing up and syncing files to and from remote servers using FTP, SFTP, WebDAV, and many major cloud services like Google Drive, SkyDrive and Amazon S3. GoodSync's powerful technology is years ahead of the pack. Excellent reviews by industry experts and customers alike solidify GoodSync as a leader in file backup and synchronization market. 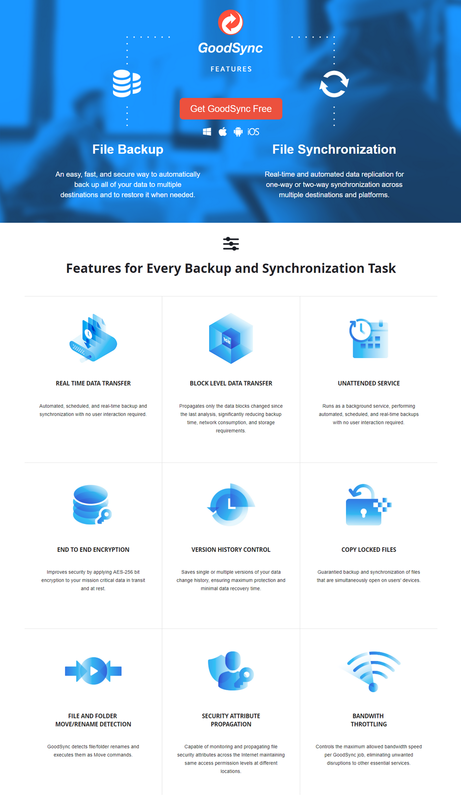 GoodSync file synchronization and backup software combines bulletproof reliability with an extremely easy to use interface to analyze, synchronize, and backup your emails, contacts, photos, iTunes, MP3s, and other important files. Automatically synchronize and back up your important files between desktops, laptops, external drives, windows mobile devices, or to remote servers using FTP, SFTP, WebDAV, and more. Using an innovative synchronization algorithm—GoodSync file sync software is years ahead of the pack when it comes to file synchronization. GoodSync will help you prevent information clutter by backing up important files and syncing files from multiple locations. All this can be set on a schedule and the program will do this automatically at the times you specify. Keep your files backed up and up to date with one click, and most importantly begin enjoying your peace of mind, knowing that your financial documents, work files, emails, contacts, photos, iTunes, MP3s, and other data is automatically synchronized and backed up. It's great program to backup and synchronization any data, I've been using it for a few years. * GS-runner integration with GUI: Change it from Shared Memory to socket-based protocol. * Unattended Jobs: show percent of completion, not just general status. * Unattended Jobs: show rolling log, as sync progresses, not the final log at the end of sync. * MS graph (OneDrive, Office): Fixed downloads running over 1 hour produce Auth error. * GSTP: improve speed of reconnect on Receiver Server, if connection is lost on Client side. * RDC tunnel: make it work again, use correct connection type on remote end. * CC Runner: Fixed first AutoUpdate of CC Runner was picking up regular GoodSync. * CC Runner: Fixed user profile was incorrect on initial setup, so log cleanup was too broad. * No Mediator option: show it only for Windows Server and File Server installers. * License Check: do it for GoodSync Account too, wait 60 sec after wakeup from sleep. * Permissions: correct translation of ReadOnly flag from Windows to Linux. * Storage Beta: now allow 100 Gb storage trials. * gs-server + Mediator: Fixed registration was happening too often, if no UPNP is present. * Forwarder/GsServer: give client more time to close connection or send EOF. * gs-runner: Use dynamic ports, if default port 33555 is taken. * gs-server: Use dynamic port, if default port 33333 is taken. * GSTP with no UDP: make it work faster by using Pipe Forwarder. * GSTP file close: increase allotted time, so that it can complete. * GSTP client: improved switching from Direct to Forwarder and back. * GSTP receiver: fixed several issues, to speed up session pickup. * Gs and Runner Installer: improved some sequences. * GsRunner Service: Fixed GsRunner did not come back after Sleep and Wakeup. * GS Account Setup: Computer page: Check that proposed Computer name does not already exist. * Mediator does not allow connecting to Computer if two devices registered under this one name. * Mediator does not allow GSTP-2 protocol, so all GSTP computers must be updated to latest ver 10 or 9. * Forwarders: improved and speed up reconnect sequences. * Activation: if user enters License Key (Batch Code) into OrderID, advise him to do it in GS Account online. * Browse dialog: fixed crash on non-recognized URL. * MEGA FS: Added support for 2-factor authorization. * GsRunner + UnAttended jobs: Drop log lines if GUI did not pick them up, fixes memory leak. * Gs2Go: Allow portable volumes to have Disk Letters A: and B: as diskettes are long gone. * MS Graph: Added support for reading paged responses to /groups query. * GoodSync Account Setup: No Mediator mode: Do not check for dup users or computers on Mediator. * GoodSync Account Setup: No Mediator mode: Allow to keep existing user, after warning. * GSTP Client: if Server got no external port, do not try Direct connection, it is waste of time. * GSTP client: rewrite direct/forwarder decision, to switch faster and more accurately. * GSTP Server: When switching from Forwarder mode to Direct mode, stop Receiver and wait for it. * GSTP Server: Direct mode: finer per Session locking, not per User. * GSTP Server: Fixed Sessions that were Disconnected with Error were not released (memory leak). * GSTP Server: Make sockets of properly closed sessions linger for 10 sec, for client to receive. * GSTP Server: Pickup Receiver: made it work better when we have lost connections. * GSTP Server: Web UI: improved Settings presentation. * GSTP Server: UDP receiver: Fixed could cycle on multiple UDP receive errors. * GSTP Forwarder: reject inactive sessions on server side sooner, do not let them linger. * GSTP Forwarder: increased speed and stability by more holistic locking mechanism. * GSTP Forwarder: Allow User Forwarders, if user sets 'UserForwarder = Yes' in settings.tix. * License on Linux: fixed Licensing by finding working PNEs, not just eth0/1. * GSTP server: Fixed Server may get no Assigned Forwarder, show error 'Update your Server to latest version'. * GSTP Server: Fixed re-asking for results of a long-running transaction. * GSTP Forwarder: more fixes for faster reconnects. * MS Graph FS (Office 365, SharePoint): List additional root sites under /sites. * Backblaze B2: Upload of short files,: Do not reuse URL of 'b2_get_upload_url', always get a new URL. * Fixed NTLM auth, used in IIS and Windows Server. * Localization: Fixed localization of GoodSync Account setup was not working. * S3: Fixed errors in header names that resulted in Bad Signature error. * GSTP client: reduced timeouts, for faster reconnects. * GSTP client: Fixed connection history management, to better try Direct connection when needed. * GSTP server: Direct Server: Fixed Sessions were not cleaned up. * GSTP server: Deprecate Basic Auth use only Digest Auth. * GSTP receiver: Improved reconnect latency, make it faster. * Logging: Fixed HTTP transactions were logged at Details level. Current time: 20 April 19, 10:34 Powered By MyBB, © 2002-2019 MyBB Group.